Can the digital transformation stop you quitting guitar lessons? Depending on your mindset, technology is responsible for revolutionizing or disrupting almost every aspect of our lives. When thinking about the much talked about digital transformation, you probably won’t automatically think of guitars or learning how to play them. Faced with the danger of becoming irrelevant in a digital age, Fender Digital is responsible for the modernization of Fender with a new division dedicated to the art of digital education, innovation, customization, and mobile learning. If you have ever typed in the question “How do I learn to play the guitar?” into your favorite search engine, Fender is hoping to that their new digital platform will get you up and running in seconds before you get distracted by ticking something else off your bucket list. Our mobile-first world consists of You-Tube how to videos, Spotify playlists, and instant gratification. The days of learning to play Smoke on the Water in a guitar store do not have the same appeal they once had. So, where will the musicians of tomorrow learn to play guitar and become the Jimi Hendrix and Eric Clapton’s of today? 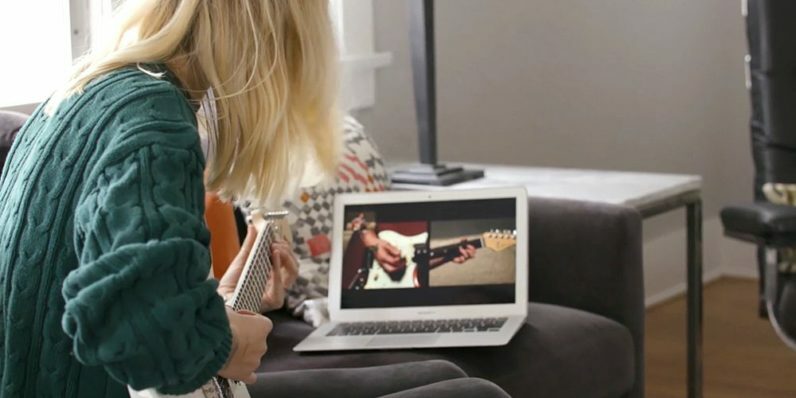 Fender Play is hoping to fix this problem with their new on-demand video-based online learning platform (think Netflix of at-home guitar lessons) featuring instructor-led lessons with personalized curriculums based on the user’s favorite songs. When it comes to music, students are traditionally isolated to limited options such as a combination of textbooks and musical instruments. The study and learning practices from our former analog world stand accused of being boring, stressful and even uninteresting to digital natives. As a result, students are already turning their back on learning music in schools. However, it is hoped that digital learning tools will bridge the gap between today’s iPhone generation and classical music curriculum. Next generation learning platforms provide a software ecosystem with tools that give learners, teachers, administrators and parents access to direct communication, learning tools, information, and resources, not only within the school but outside it as well. One of the biggest benefits of digital learning is its power to bring the classroom to life with lots of features that can help not only the students but also the teachers. The invitation for frustrated air guitarists to embark on their own rock ‘n’ roll journey by playing hits from their favorite artists from superstars such from The Rolling Stones, U2, Foo Fighters and the National in a real life version of guitar hero will have obvious appeal. Replacing one size fits all approaches to teaching with personalized learning paths speed up the learning process makes sense in principle. But Fender Play promises that even beginners will have the ability to master chords and riffs while learning to play their favorite songs. In a digital world where household names are desperately trying to protect themselves from being the next Kodak or Blockbuster video, it seems that every industry is ripe for disruption. By adding 4K quality multi-camera video footage of instructors delivering easy-to-digest lessons, does Fender Play have what it takes to be a big hit? Contrary to popular belief, the musical instrument industry has not been left out of the digital world, with various digital platforms that enable students to improve their playing skills. These are just a few reasons why the legendary guitar makers are right to take this proactive approach with a video based learning platform. Fender’s intuitive platform, whether being used on its own or as a practice supplement to in-person lessons, should at least help first time players and beginners to get started on the right foot. The ability to choose the songs and instrument to learn from should make it easier to hold the attention of any wannabe musician. The platform also enables users to track their progress in real-time with a personalized user-friendly dashboard. Learning at your own pace across a plethora of devices such as laptops, smartphones, and tablets ticks all the right boxes. But, will users want to take their lessons on the road? In a digital world where we search YouTube to solve almost any problem, the large glossary of helpful terms, chords in learn to videos is a refreshing approach to learning how to play the guitar. Only time will tell if it will be enough to put the 70-year old guitar manufacturer back into center stage. But unlocking the instrument for guitarists of all skill levels through state of the art digital learning technology is a big step in the right direction.